Spectacular section of immense Inca road network near Huaraz. Trek with llamas, camp under star-laden skies, explore little-visited ruins, meet locals. Qhapaq Ñan 7D - Great Inca Trail. Chance to experience spectacular section of immense Inca road network. Qhapaq Ñan declared UNESCO World Heritage Site in 2014. Trek with llamas, camp under star-laden skies, explore little-visited ruins, meet locals. Begins and ends in Huaraz, hiking through Cordillera Blanca for five days. 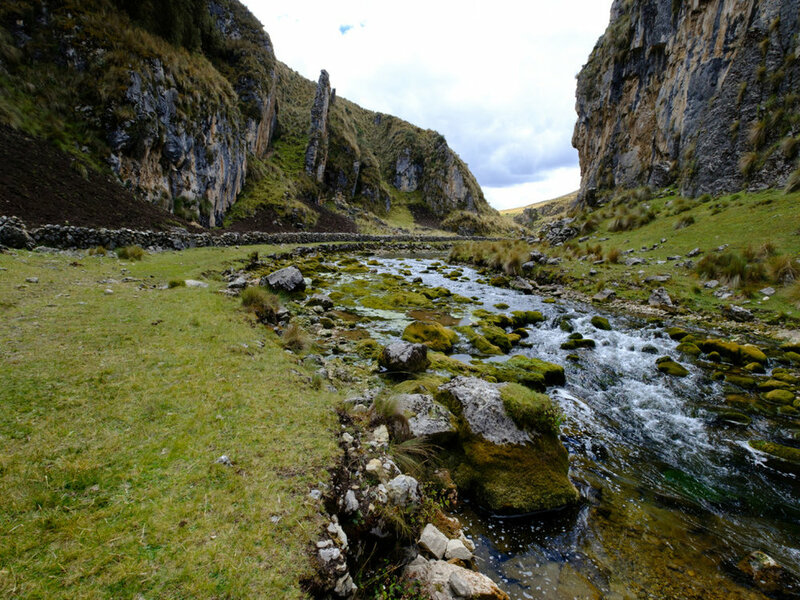 Comfortable camping near Inca archaeological sites, such as ushnus and tambos. Trekking on well-preserved routes with Inca walls that are more than 500-years-old. 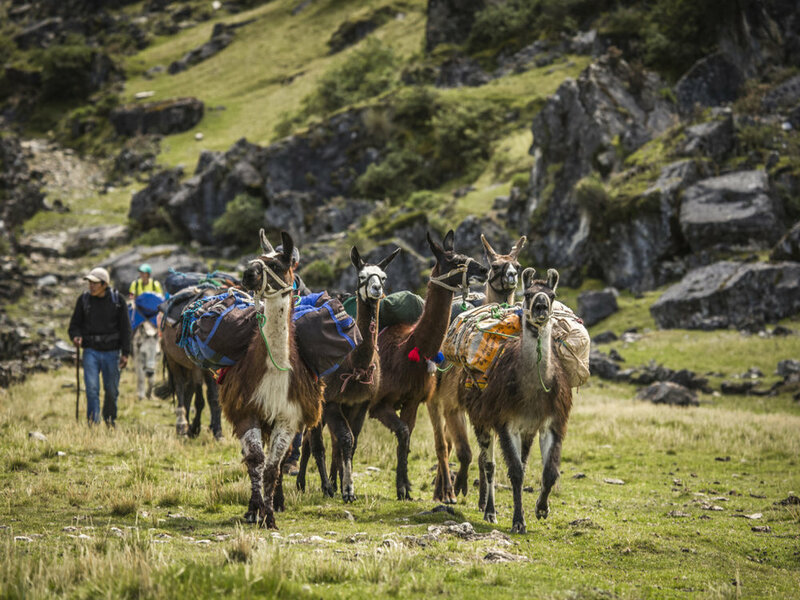 Using llamas as cargo-bearing animals – an Andean custom that is in danger of disappearing. Participation in traditional ceremonies, such as the tribute to Pachamama (Mother Earth). Typical regional dishes, prepared with traditional ingredients, to delight the palate. Traditional dance at Huanuco Pampa. And by continuing to enjoy and celebrate the architecture and lifestyle of the Qhapaq Ñan, we hope to breathe fresh life into this incredible UNESCO World Heritage Site, that spans six nations. Below prices are per person, based on a private trek, sharing two-person tents. The price decreases for larger groups: ask us for more details. Upon arrival at Huaraz airport or bus station, you will be welcomed by a guide, who will take you to your hotel. You can immediately delight in the spectacular view of the snow-capped Cordillera Blanca mountains. You can make the most of the afternoon with a city tour, seeing the main attractions of the city; or you may like to stretch your legs in preparation for the trek ahead, with a hike to one of the many natural attractions in the area, such as Lake Churup (optional). Overnight at your Huaraz hotel. NB. We can arrange extra nights in Huaraz for longer acclimatization to the altitude and exploration of the region, if desired. A driver will pick us up this morning, to make the drive across Callejon de Conchucos to the small town of Castillo. Along the way, we pass the beautiful Querococha Lagoon and go through Kahuish Tunnel, one of the highest road tunnels in the world. Intricate stele at Chavin de Huantar. We stop to visit Chavin de Huantar, one of Peru's best-known pre-Columbian ruins, with a small but excellent site museum. We have lunch at a local restaurant, before continuing our drive. In Castillo, we begin our trek with a three-hour ascent to Soledad de Tambo, where our camp is set up. We have lunch here and then visit the ushnu (ceremonial platform), with an archaeologist who will explain the importance of this place. Distance walked: 2.6 km / 1.6 miles. Explorer & llama at apacheta on Qhapaq Ñan. Today, we walk through one of the Qhapaq Ñan's best-preserved sections. We climb Inca-made steps up to Wagapunta Pass (4,572 m / 15,000 ft), for an astonishing, panoramic view of Andean peaks ... that will leave us as breathless as the ascent! Here we are surrounded by apachetas - small towers of stone, with religious significance to the Incas. We will arrive at the camp in Quenhuajirca by the afternoon, in time to visit the workshop of master weaver, Juan Araujo, and learn about his traditional work. Distance walked: 17 km / 10.5 miles. We begin our day descending to the village of Ayash, located in a picturesque valley. From here we climb again, along the Qhapaq Ñan, to Huamanin village. 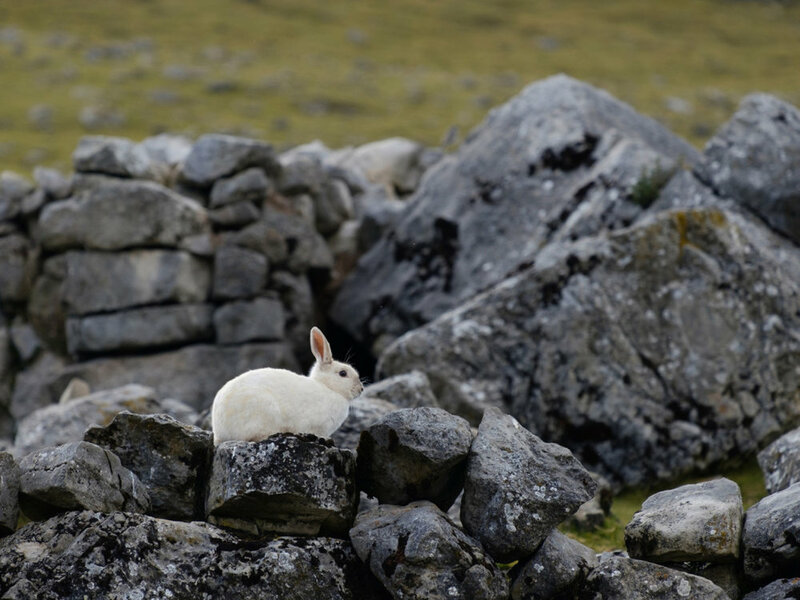 White rabbit relaxing at Tambo Grande. The road goes down, along the Taparaco River basin, to Tambo Grande where we spend the night - close to stone walls steeped in history and under stars that defined Inca cosmology. Tambos were structures built by the Inca along the length of their road system, to serve administrative and military purposes, as well as provide storage of supplies and lodging. Tambo Grande is now home to a large number of rabbits! Taparaco River running beside Qhapaq Ñan roadway. Today we walk through the beautiful Taparaco Valley, along a road lined with Inca walls that are almost fully intact. The relaxing sound of the Taparaco River flowing next to us, between groups of queñua trees (Polylepis rugulosa) accompanies our journey ... a journey reserved for few adventurers. The campsite is located at a lovely spot, by the river, at San Lorenzo de Isco. Distance walked: 18 km / 11 miles. Steps up to ushnu at Huanuco Pampa ruin. Our last day of walking involves descending to the town of Colpa. From there we are taken by vehicle to Huanuco Pampa (also known as Huanuco Viejo or Wanuco Marka), one of the most important administrative centres of the Chinchaysuyo, the northern region of the Inca Empire (Tahuantinsuyo). A two-hour guided tour of the impressive architecture will include the ushnu, the Inca water source and the incawasi (Inca house). As a final treat, lunch today is a pachamanca: a traditional, hearty Andean meal of various meats and vegetables cooked underground. A private vehicle will take us back to our hotel in Huaraz. Distance walked: 7.2 km / 4.5 miles. At the appropriate time, a driver will pick you up from your hotel and take you to Huaraz airport or bus station for your journey back to Lima.